Jhua Pet Grooming Gloves 1 pair are upgraded version, elastic wrist strap and durable materil fabric, one size fits most of sizes of hands, easily and effectively removes pets' tangles and dead furs when bathing or not. Soft silicone tips are safe and comfortable for pets like dogs, cats, horses, rabbits., etc to clean and relax/ massage themselves. 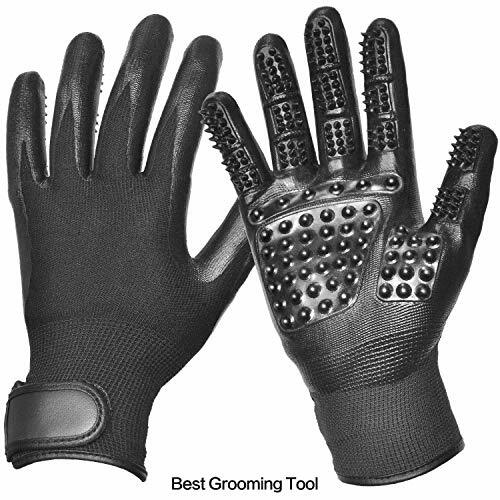 ★The inside room of the grooming gloves is large enough and elastic to fit different people with varying sizes of hands. And the elastic wrist strap is equipped with an adjustable strip to ensure that the glove won't fall off easily. Breathable material guarantees the breathability. Note: Children are not suggested to wear the gloves. ★This efficient pet hair remover also functions well as a pet massage tool. Massaging for your pets or other domestic animals like bunnies, goats, cows, horses and so on will please both their bodies and minds. It will also make your loved pets healthier by stimulating blood circulation. Last but not the least, spending more time with your pets and taking care of them will boost the strength of your relationship with them. Our products have to pass strict test,inspection and packaging before they are sent off. You can rest assured shopping in our shop. If any problem, please feel free to contact us and we will offer you the best service. Thank you and happy shopping! 【Effective and Healthier Pet Deshedding Gloves】-made of Nylon material, close to hands with strong elasticity,one size fits most of hands in different sizes, comfortable and breathable. 【Soft Silicone Tips are safe and Environmentally-friendly】-glides through the fur gently and doesn't tug at all.Not only removes shedding hair out also dirt and grime, safe enough not to hurt pets. 【Breathable Material & Elastic Wrist Strap Mitts for Pet】-the back side of the pet grooming gloves is made of durable and elastic polyester fiber. So the pet hair removal glove endows with good resilient and excellent breathability. Its wrist strap is adjustable to suit different users with varying sizes of hands. 【Multifunction Pet Gloves & Wide Application】-to remove loose pet hair knots and tangles, to clean dirt and massage your pets are all at the gloves. No matter while you're bathing your loved pets, deshedding the loose hair or just relaxing them, the pet mitts will surprise you and your pets. 【Easy to Use & Clean】-just put the grooming gloves on and gently comb out pets' excess hairs and furs. Then the hairs and furs will be collected on the glove and easily peeled away as a whole piece. The front side of the gloves is waterproof-coated and the back side is fast-drying, so directly washing them with water will be fine. View More In Hair Removal Mitts & Rollers. If you have any questions about this product by Jhua, contact us by completing and submitting the form below. If you are looking for a specif part number, please include it with your message.